Dropbox is cloud file storage and syncing service that allows users to upload and save files from their computers. A user will have to download a file from the internet first to his computer before uploading it to Dropbox, at least this has been the tradition but today I want to show you how you can save files directly to Dropbox from the internet without having to download it to your computer first then uploading to Dropbox. That will be like doing a task two times, let me show you a one-way to save files directly to Dropbox without having to download first and upload later. Since the file you want to save to your Dropbox is already on the internet (cloud) why shouldn’t it be easier to save it to the clouds as well? sideCLOUDload is a web service that will allow you to save files directly to Dropbox without having to download it to your computer first and uploading it to Dropbox. 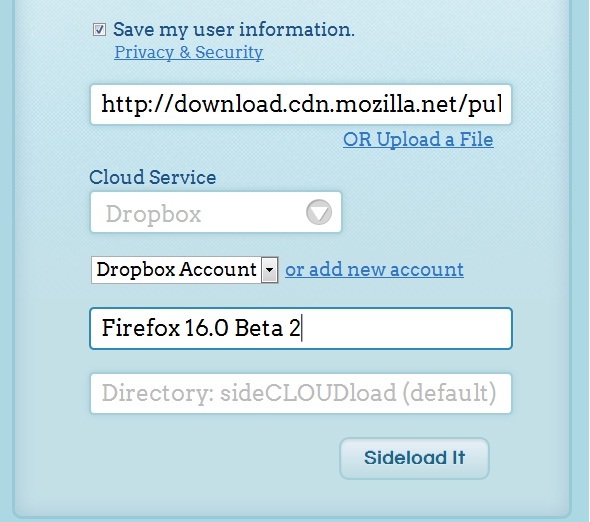 sideCLOUDload is just a step process to save files directly to Dropbox. First create an account with sideCLOUDload and activate your account from the activation email that will be sent to the email address you provided during registration. Next let’s assume you already have a Dropbox account (if you don’t, click here to create one now). Login to your Dropbox account. 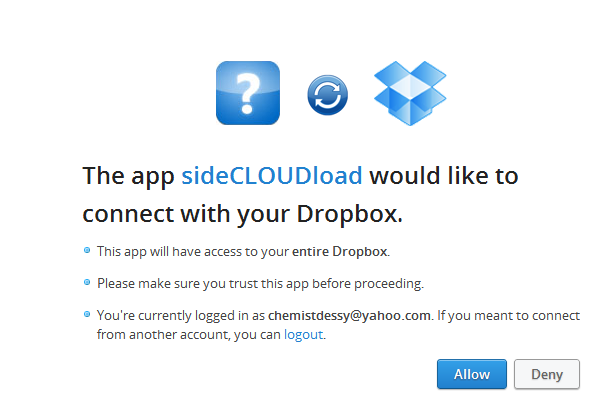 Then Login to your sideCLOUDload account, under cloud services choose Dropbox and you will be asked to add a Dropbox account to your sideCLOUDload account. A notification that sideCLOUDload will like to connect to your Dropbox will be displayed, click on “allow” and you will be required to add a description to the Dropbox account and update. Next get the file url that you want to save to Dropbox. File size shouldn’t exceed 25MB. Then go back to sideCLOUDload and you can appropriately fill in the other options by providing the file name and the directory you want it saved in your Dropbox if you have any else leave it on default. Then click “Sideload It” button. 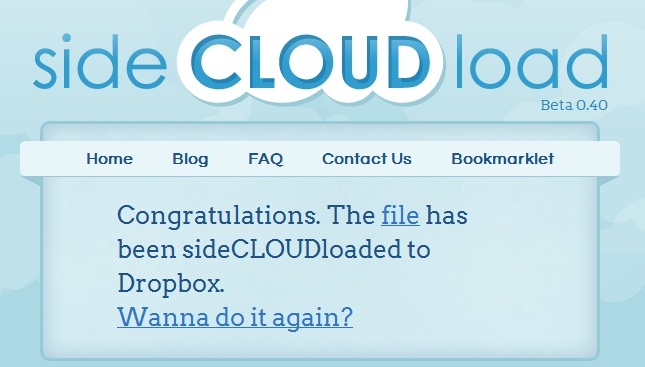 sideCLOUDload will then search for the file, sideCLOUD it to your Dropbox account and give you a confirmation that it has been sideCLOUDed to your Dropbox account successfully as indicated on the image below. Visit your Dropbox account to confirm the file has been saved in its appropriate directory as indicated below. I hope you find this tutorial useful, now you can be able to save a file from the internet directly to your Dropbox account without having to download it to your computer first then uploading it to your Dropbox using sideCLOUDload free services. If you find above post on “Save files directly to Dropbox from the internet using sideCLOUDload” interesting and useful, please share this post with your friends using the share tools on the left hand side of the browser or the ones under this post. Please if you haven’t liked our Facebook page simply click on the “Like” button on the right hand side of the browser. You can also follow us on Twitter right under the Facebook page. I hope you read my blog post on “Cloud Sync services: Comparing Sugarsync, Windows live mesh and Dropbox“.